Les Croix de Bois. (Wooden Crosses) The WW I trenches as seen by Raymond Bernard. There have been feature length films about World War I since just after the war ended, namely Abel Gance’s in recent years fully restored ‘J’accuse!’ (I Accuse, 1919) and King Vidor’s ‘The Big Parade’ (1925) during the silent era. And also in the early sound era with Lewis Milestone’s Oscar winning ‘All Quiet on the Western Front’ (1930) and the Pabst masterpiece ‘Westfront 1918′ (1930). In later years you had Kubrick’s brilliant ‘Paths of Glory’ (1957), Francesco Rosi’s ‘Uomini Contro’ (Many Wars Ago, 1970) and Tavernier’s ‘Capitain Conan’ (1996) to name but a few. 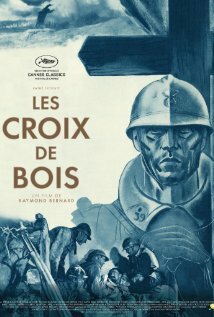 Another major film dealing with WW I film dating from the early sound era is Raymond Bernard’s ‘Les Croix de Bois’ (Wooden Crosses, 1932) beautifully restored in 2014 and released on DVD/ Blu Ray by Pathé in Europe and by Criterion in 2007 in their Eclipse Series, also including Bernard’s 5 hour version of ‘Les Misérables’ (1934) THE version of ‘Les Misérables’ you definitely need to see: 1) it’s great cinema, 2) it has a great actor Harry Baur as Valjean and 3) it has no songs!!! The film is based on Roland Borgelès’ novel of the same title depicting his real life experiences and that of his comrades during WW I. The Wooden Crosses are off course refering to the many crosses that had to be erected for each fallen soldier. The film is brilliantly shot by Jules Kruger, also responsible for Gance’s legendary ‘Napoléon’ (1927) and Marcel L’Herbier’s ‘L’argent’ (1928) to name but a few of his impressive credits. The footage of the battles scenes were used several years later in Howard Hawks’ ‘The Road to Glory’ (1936), yet another WW I film. The film has groundbreaking early sound mixing that tries to recreate the sounds of war as realistically as possible, including great use of offscreen sounds of murmuring wounded soldiers. In the supplementary material (the Pathé discs only) you can find an interesting excerpt from an interview with Bernard discussing the extensive testing they had to do to finally be able to capture the realistic impact of explosions and sounds of machine gun fire by using multiple microphones at once at different distances. Bernard also explains they’d filmed on the actual locations where the actual WW I trenches had been which at the time of filming were still partly visible. Painfully so, on several occasions they even found corpses of fallen soldiers that could still be identified. Next > Suffragette. Classic treatment of an important subject matter.